Overconfident CEOs tend to lead to less corporate social responsibility in a company, our research shows. The more confident the CEO, the less their firm invests in activity that has a positive impact on society. We looked at 2,138 firms with 3,478 different CEOs from US exchange listed firms across all industry sectors, and calculated overconfidence by measuring executive compensation. We looked at the share options provided to CEOs: if the CEO fails to exercise these options (selling them off) it means they are overconfident about their company. If a CEO invests in corporate social responsibility it’s like an insurance policy. The CEO is mitigating the risks in a number of areas by planning strategies around them, so the market is more lenient if the firm suffers some setback. These sorts of areas include: community involvement, corporate governance quality, workforce diversity, employee relations, environment, human rights and product quality. For example, another study found firms with higher levels of corporate investment that were socially responsible suffer less damage to the company’s value in cases where there’s a product recall due to a defect. Being a good corporate citizen has positive spillover effects. This lack of confidence reduced aspects of social responsibility the most in the institutional aspects of social responsibility, such as community and workforce diversity. This is in contrast to the technical aspects of corporate social responsibility such as corporate governance and employee relations. Community aspects of social responsibility include giving to charity and support for non-profit organisations. Also included are support for housing initiatives or education that supports economically disadvantaged people, volunteer programs and indigenous peoples relations. Workforce diversity includes support for women on the board, outstanding employee benefits or other programs addressing work/life concerns. We also found a significant difference between male and female CEO confidence levels and the level of investment in corporate social responsibility each undertakes. Female CEOs are significantly less overconfident than male CEOs and undertake significantly more social responsible investment than male CEOs. However, the gender of the CEO doesn’t impact our original finding of overconfidence leading to less social responsibility investment. CEO overconfidence has been blamed for business failure and financial distress. Research finds overconfident CEOs increase the risk of bankruptcy. There is also evidence to suggest overconfident CEOs take greater risks and insure less than their non-overconfident peers. Shareholders are keen to invest in companies that are headed for success. They may therefore be attracted to the high risk, high reward strategy of the overconfident CEO. On the other hand, shareholders are showing more interest in investing in firms who minimise risks associated with environmental damage and negative impacts on social well-being. We argue that overconfident managers do not correctly recognise these risks and invest less in socially responsible behaviour than their less confident peers. We also considered the impact of narcissism in our study. CEOs that have narcissistic traits have a strong need for admiration from shareholders. Investment in social responsibility has been shown to be a good pathway to help CEOs obtain this admiration. There’s also research that links narcissistic traits with overconfidence. However our study found there was no relationship between narcissism and social responsibility. 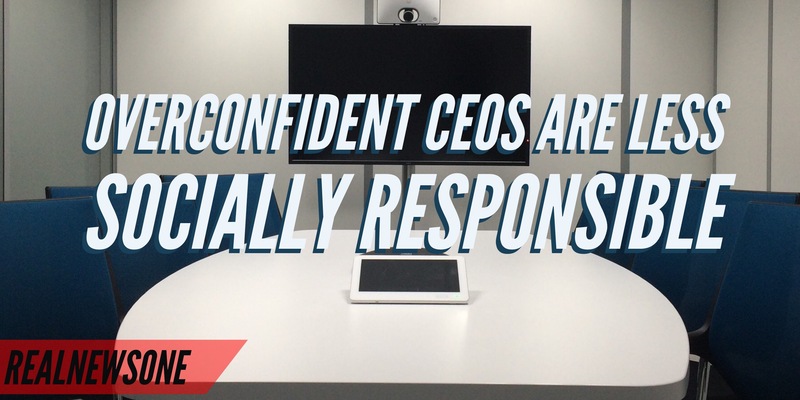 We found instead that the risk aspect of overconfident CEOs dominates. The take-home message for shareholders is that if you want to invest in a more socially responsible firm, you need to consider more than just the CEO’s resume. To invest in a firm with a continued focus on socially responsible investment, shareholders should select a CEO who isn’t overconfident. The challenge then is balancing that with a lack drive or direction in innovation and other positive risk-related activities that can result in growth. It’s a trade-off that shareholders may struggle with. One solution may be for shareholders to use employment contracts with CEOs to specify the level of social responsibility they want to see happening in their firms. In this way, shareholders may be able to harness the positive attributes of an overconfident CEO while maintaining a socially responsible focus.